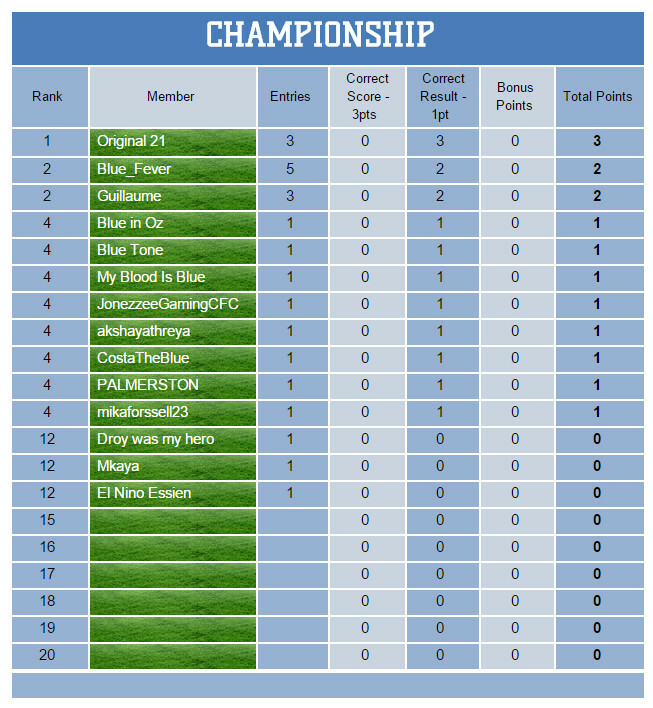 Nineteen entries this week, and it was safe to say, without even looking , there would be no perfect prediction this time around. 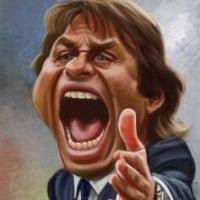 Welcome SZB LOVES CHELSEA and akshayathreya!!! Seven in four! His name is Diego Costaaaaaaaaaaaaaaa! And how about Remy on his debut? Just consolidate that defense and we are flying high! 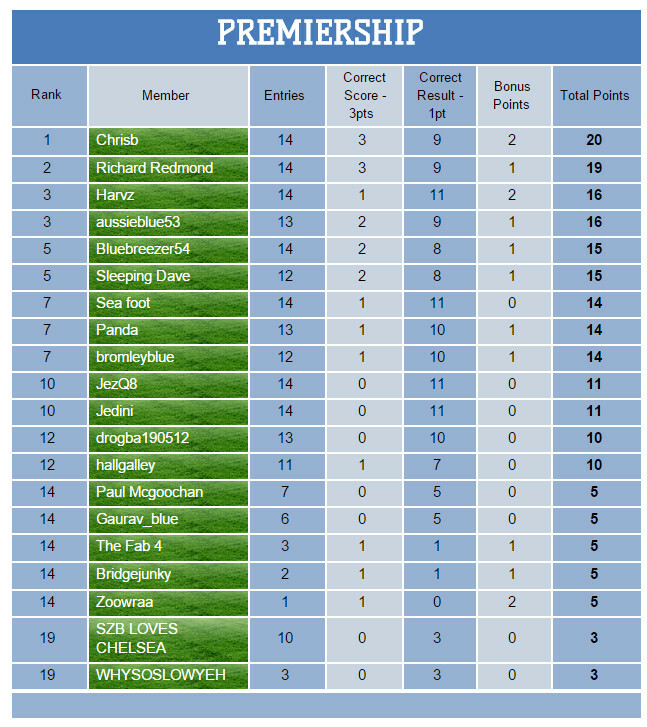 Only sixteen entries this week, and again, without even looking, it was pretty obvious after the final whistle there would be no correct result to find. Thought it would be better to wait with the table after that UCL home match, and I guess I was right since the clash at Etihad delivered six correct results, and one correct score vs zero hits from Schalke predictions! 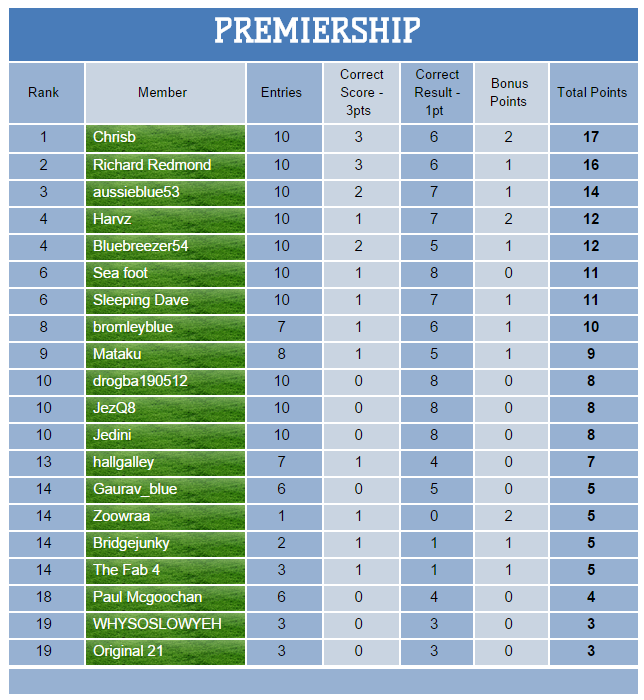 Seventeen entries for the Premiership match prediction, and only thirteen for UCL. I will keep reminding you in our matchday threads, so hopefully we'll see better numbers in coming weeks. 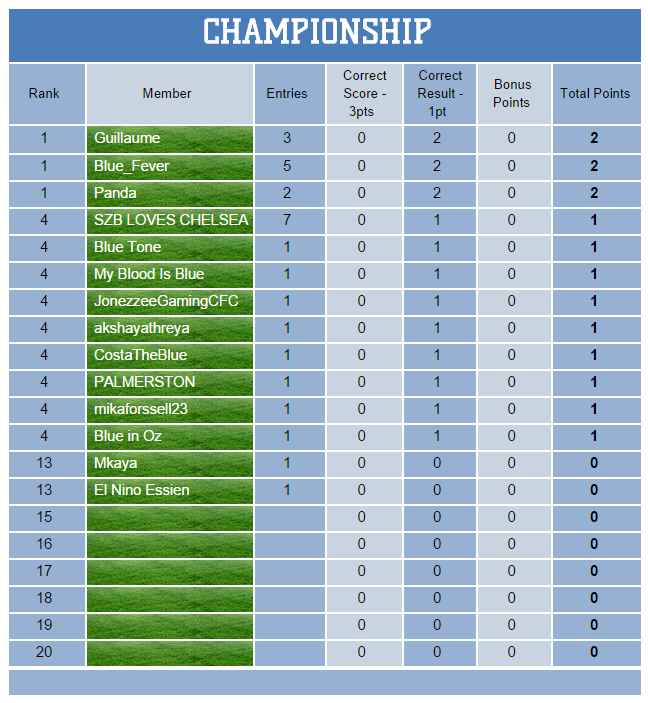 Chrisb, our last season's Champion, the only member with correct result from those two matches. 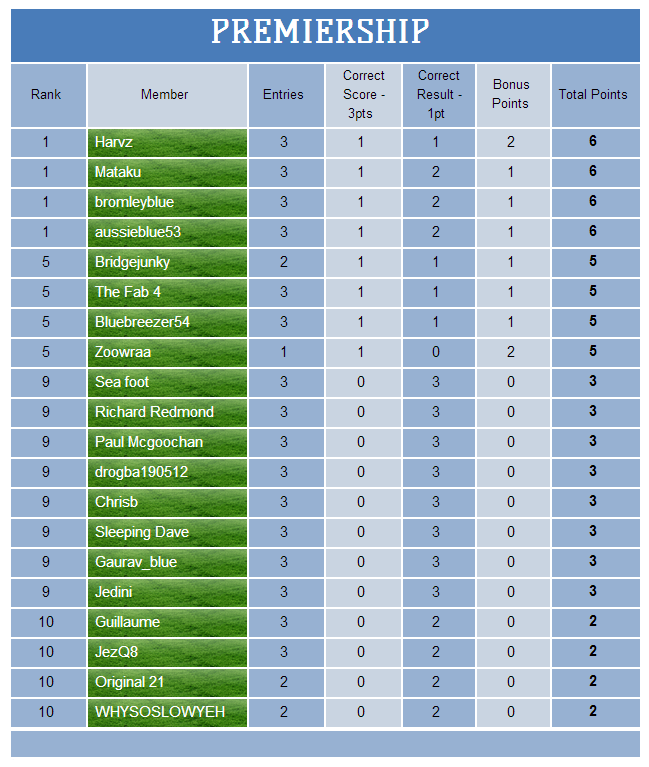 But now only two members at the top: Harvz and aussieblue53, closely followed by Mataku and Chrisb. SZB LOVES CHELSEA still without a hit after four entries. Great reaction from the team following two unlucky draws last week in UCL and at Etihad! Excellent against Villa today, and somewhat routine performance on Wednesday, when the team played League Cup match vs the Trotters. 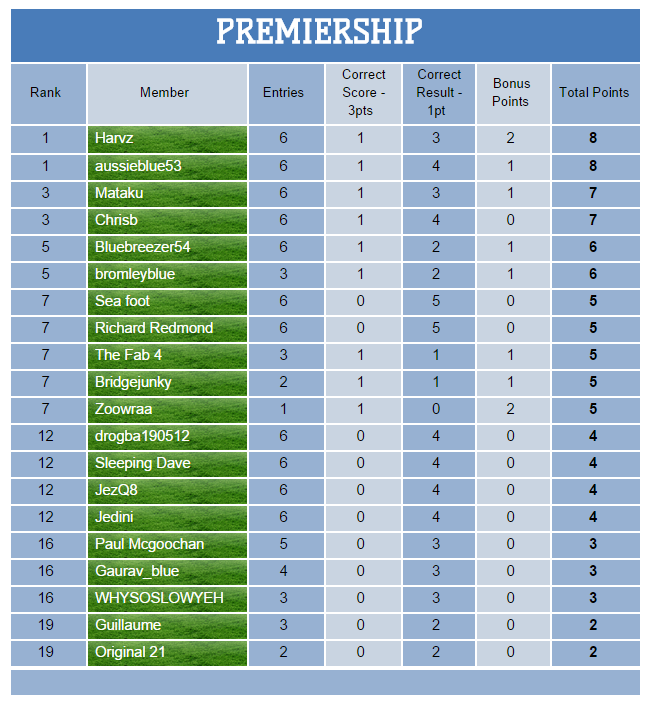 Exactly the same number of entries as last week - seventeen for the Premiership match prediction, and only thirteen for LC. I will keep reminding you in our matchday threads, so hopefully we'll see better numbers in coming weeks. How about Richard Redmond? Two out of two this week, my friends, with one extra point delivered from Diego Costa's eight Prem goal!!! Hats off to you RR! 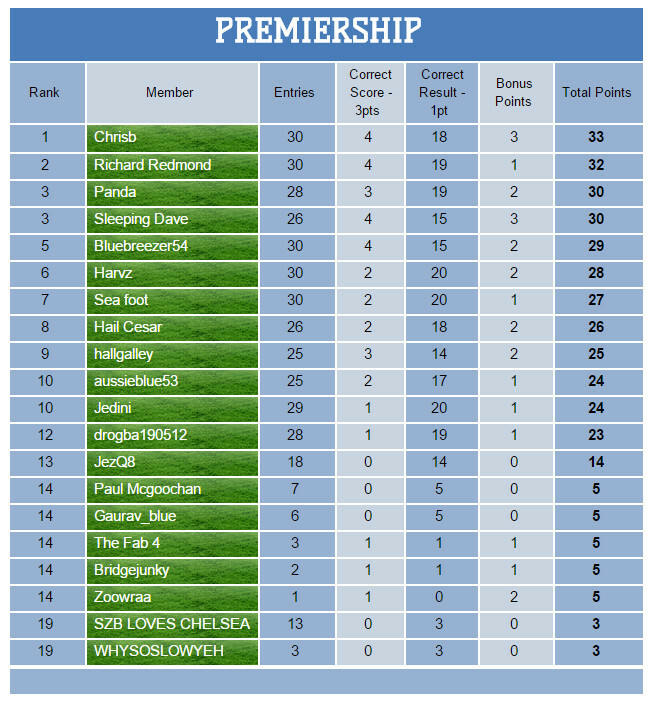 Chrisb - was he our last season't Champion or what? :) If you needed any further proof, here is one! Another perfect one on Wednesday, with an extra point on Oscar, and almost hit the jackpot for the week after his Villa prediction, but was short a single goal. 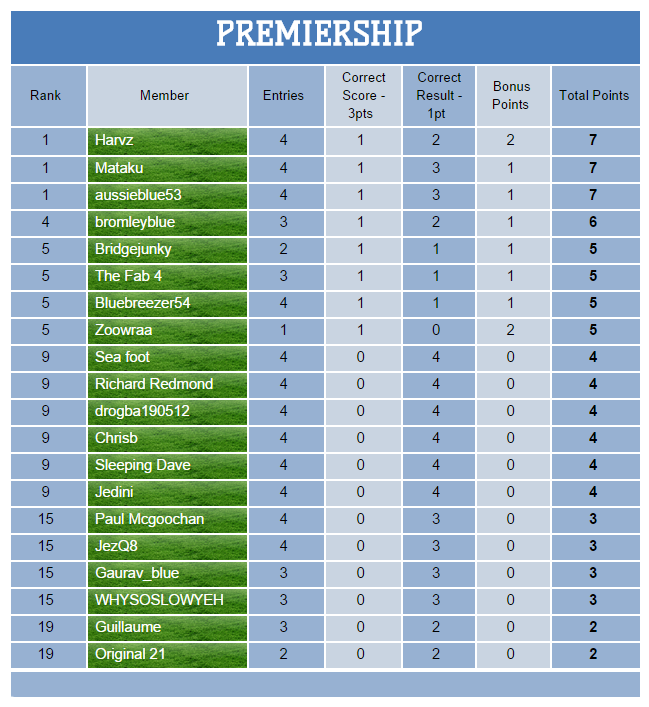 hallgalley earned himself a place in Premiership with a couple of correct scores. What a good week that was - making things the way they are supposed to be in the UCL (thanks, Maribor), and extending the streak against Arsenal. That makes three clean sheets in a row now! Higher number of entries for the UCL match (15), but the same number for the Premiership forecast represents a slight drop from previous weeks; hopefully it won't become a trend. Champions League night in Portugal brought us the most correct scores predicted for a single match (4), and combined with the ones from Arsenal (2) definitely the most in (congested) week. Richard Redmond briefly took over the first place after Tuesday, but Chrisb answered right away with a bonus point on Sunday, and that point makes a difference now. Great calls from hallgalley, aussieblue53 and Bluebreezer54 (vs Sporting), and Sleeping Dave who also earned an extra point (vs Arsenal). Now that was a busy week, and if it wasn't for Phil Dowd - it would have been a perfect one too. I will get to it right away and let the numbers do the talking. Sleeping Dave the only member to forecast the correct score from any of those four matches (!!! ), while Panda and Harvz are the only two to predict a draw at Old Trafford. Number of entries: Palace 14, Maribor 14, United 14, Shrewsbury 11. Still undefeated! 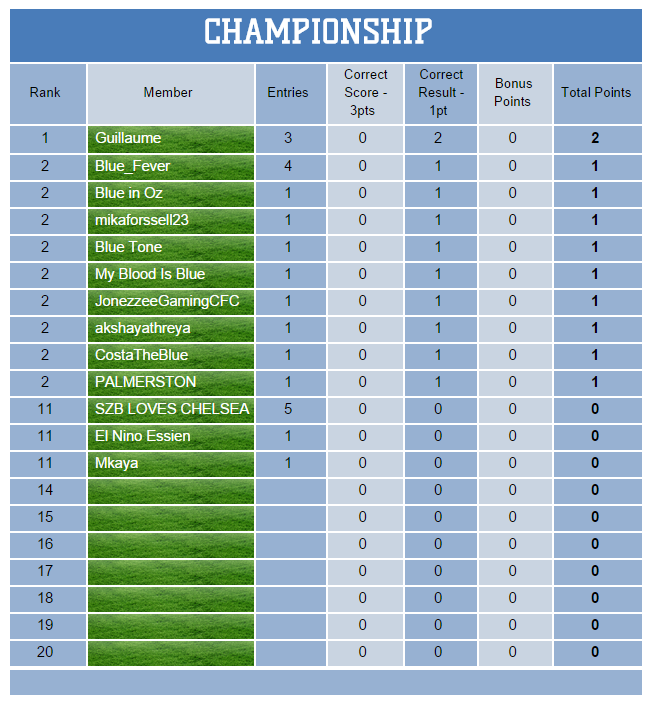 Keep it up, Chels!!! 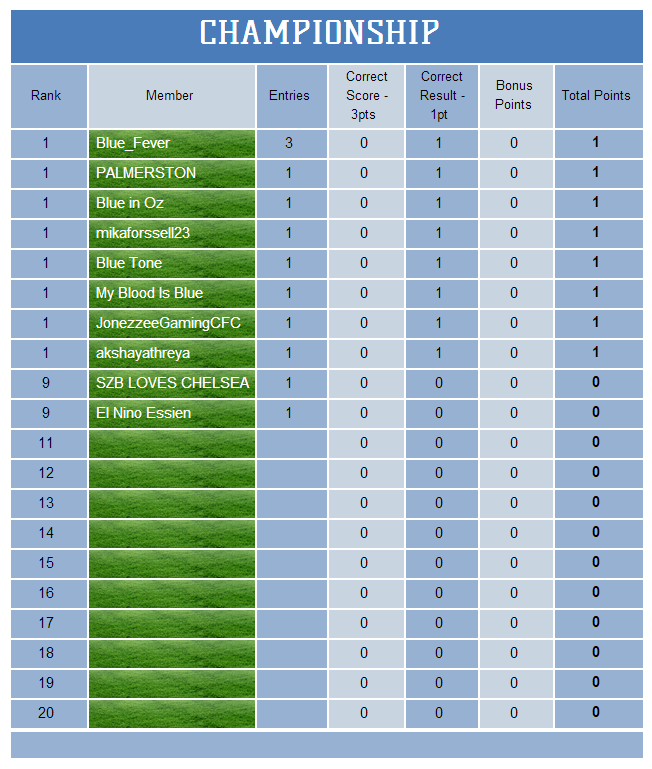 Four matches and only two correct scores, both coming from our clash with the Baggies: Sea foot and hallgalley. While Schalke and Sunderland results were both extremely tough to predict, many were very close on bagging extra points yesterday, but came up just short. It was nice while it lasted. No longer undefeated, but seems like the unnecessary burden is off our back now. I will try to do a set of four matches from now on. This time around we had six correct scores: vs Sporting - Bluebreezer54, vs Hull - Chrisb, hallgalley, drogba190512 (all three with a bonus point), vs Derby - Panda, Harvz. .
Our title holder Chrisb took the lead once again :) Here are the standings. Obviously there isn't much interest in this competition. 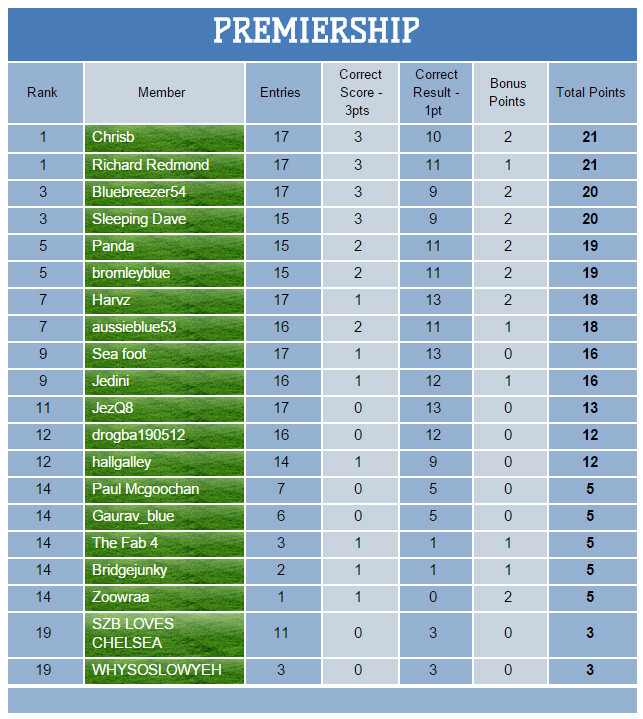 Throughout five matches only two correct scores: vs Stoke - Richard Redmond, vs West Ham - Sleeping Dave (+ bonus point). Newcastle, Swansea and Liverpool threads are up!